It's not very often that a product comes along that is so simple yet capable of producing such impressive results. Such effectiveness and ease of use comes on the back of the four years of testing and developing that took place before the KickPort was launched. Compact, sturdy design. Can be universally fitted to any bass drum from 16" diameter upwards. Great value - it costs the same as a decent bass drum batter head. 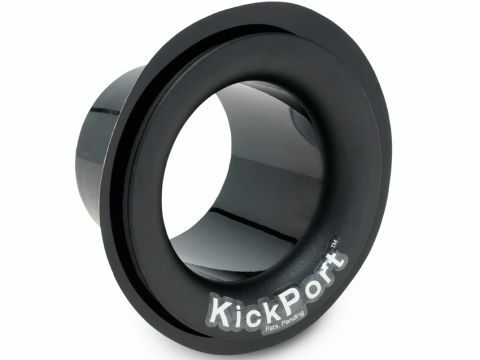 When it was launched in 2009, the KickPort created a genuine buzz within the music industry. A simple device that is easily fitted to the front bass drum head, it claims to ingeniously enhance low frequencies. While its rise seems to have been meteoric, its development was anything but, as the small US-based team responsible spent years perfecting the design before marketing it. The KickPort is made of acoustically-specified plastic, rubber and foam. Its main component is a 4"-long pipe which flares out in the style of a horn at the front end to a diameter of 5.25". A rubber cup is attached to the outside of the pipe half way along its length. The cup is shaped to follow the contours of the flared section of the pipe. For the time being, KickPorts only come in one colour - black. A white version of the KickPort will be available soon, with other colour options to follow later this year. A fitted KickPort actually grips the front head - the rubber cup ends up inside the drum and flips forward onto the head while the flared part of the plastic pipe visible outside the drum is foam-backed. Trapping the head in this manner creates an intentional dampening effect, making any usual dampening unnecessary. The function of the plastic pipe - the majority of which is located inside the drum - is to slow the exit of air produced from each stroke, compressing it along its length. The flared exit then allows for rapid expansion of the air as it meets the outside world. I tried a KickPort with my vintage Premier 20"x14" bass drum which is fitted with an Evans EQ1 batter and a Remo Ambassador front head. Due to its size and design, the drum is not as naturally deep as many contemporary kick drums, and so it made for a challenging test-bed. Fitting the KickPort was straightforward and took a few minutes. Once in, the effect was instant, giving the drum a noticeably fatter and altogether larger presence. There was also added focus to the sound, which made for a marked increase in punchiness. Rather than simply being a 'loud button' for the kick, it followed the tuning of the drum sympathetically - wherever we pitched it - so proving far more versatile than we anticipated. What impressed us the most, though, was that the drum still sounded natural and warm - not as though it had been manipulated in any way.